Dear business partners, it is our privilege to invite you to visit International Fair FAMEX 2019, April 24 - 27, 2019, Military Air Base in Santa Lucia, Mexico. Dear Business Partners, Let us express our thanks for your cooperation and wish you a Merry Christmas and a prosperous New Year 2019! The industrial production of civil planes has for a long time been a tradition in our country. 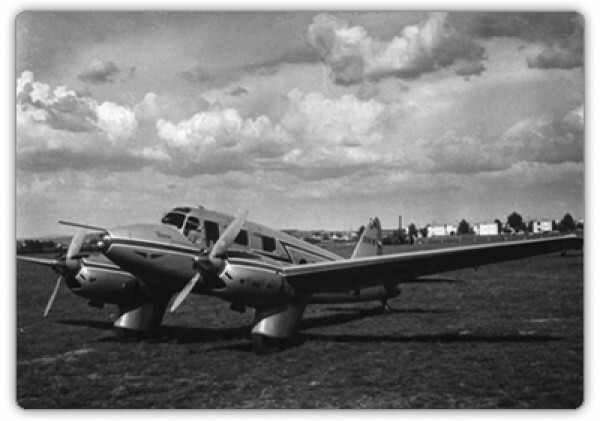 The first aircraft manufacturer in the Zlin region - company ZLINSKA LETECKA Inc. (ZLAS) - was established in 1934 by the famous businessman J.A. Baťa. The company Baťa established their own air park in the mid-twenties of the 20th century. They bought ex-service school planes Albatros BII from military administration. We should also mention one of the key employees - Jindřich Brouček, who was the first pilot of Baťa Zlin Air School, established in 1932. 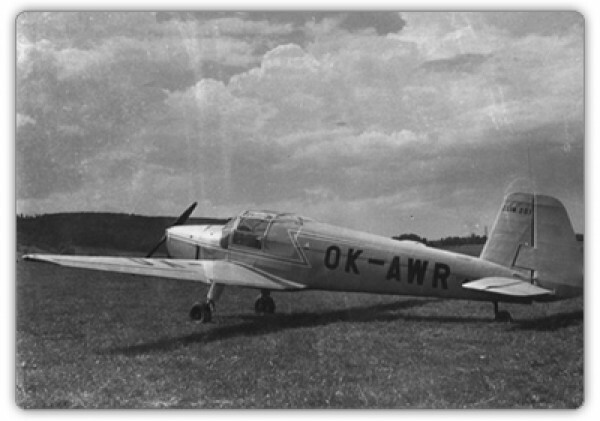 Plane production was initially directed by Mr. Dohnalek and constructed by Mr. Kryšpín. The picture was taken in front of the first school hostel in Zlin. 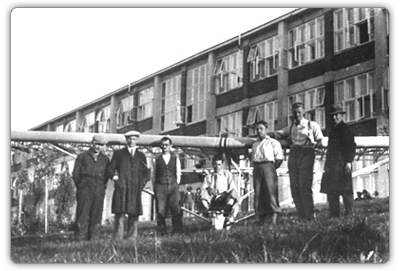 In 1933 company Baťa financed production of the first sailplanes in Zlin. 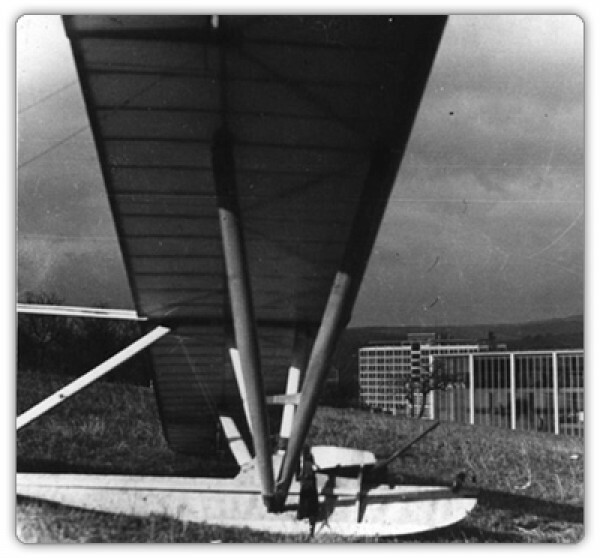 Sailplane Z-I was the first series produced plane in Zlin. It was constructed by Mr. Jan Kryšpín. It was followed by a gradual progress in motor-less types Z-II to Z-VIII. 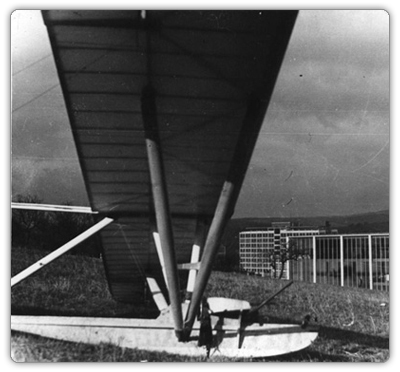 Sailplane Zlin I in the area above the hostels, from which the planes used to take off using " a bungee cord". Bata's advertising skills were excellent. During one meeting Bata presented a vision that “every postman should get his own plane as soon as possible”. The first and most successful engine powered plane was slim and had an all-wood low wing. The Z-XII soon became a living legend of pre-war sport flying. This aircraft became the model for a series of aeroplanes marked Z-212. Z-XII was powered by the original American engine - Continental. Soon, there was in-built home-made copy of this engine called Persy - manufactured in a new engine department ZLAS. Serial production of the open cockpit version of the Z-XII plane constructed by J. Lonka. 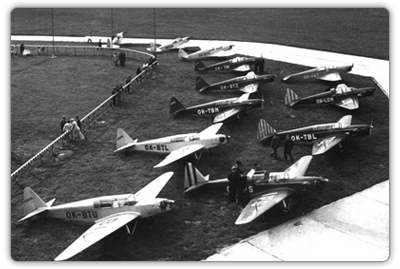 A flotilla of Zlin Z-XII at an air show in Otrokovice. 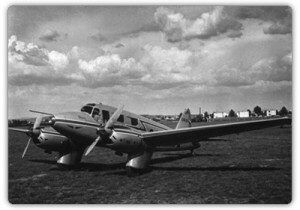 In 1937 Mr. Lonek constructed a speedy travelling /courier plane Z-XIII. It was an elegant all-wood low wing plane with landing flaps, Ratier variable pitch propeller and the remarkable top speed of 350 km/h. Progress in this plane and other projects was halted due to events of the war. Other potential projects were lost during the war years. Otrokovice airport was occupied by the Germans on March 15th, 1939. Pilots and technical engineers were arrested. During the second world war production was limited to only the licensed plane types Klemm KI-25 and Buckem Bu-181 for the German Wehrmacht. 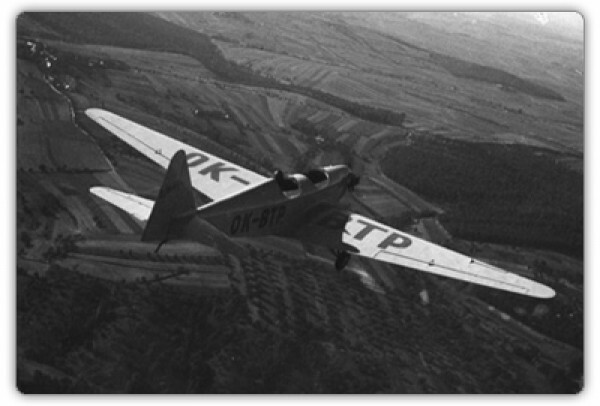 The total quantity of these planes manufactured in Otrokovice reached 723. The company was taken into public administration after the second world war. Production of two-seated sport planes Z-181 started with German engines. Initially it was re-made Bu-181's but the engines produced in our company were used soon after. These planes were marked as Z-281 and Z-381 and 465 pcs of them were manufactured in 1945 – 1951 respectively. Production of the new planes with our own construction was able to start almost immediately after the end of the war since preparations were secretly continued during the war. The production of a new engine Toma 4 (105K) started in 1946. Later the engine was replaced by Walter Minor 4 (Z-381). Z-281 type Bu-181 with the engine Toma 4 A prototype of the post-war twin-engined Z-20 was never produced, despite its good flying characteristics. It represents the only one twin-engined plane in Otrokovice, Z-20 with Argus engines. But the production was not allowed. There was also a four-seat version of the Z-122 motor plane. Only 2 prototypes were made but they were very good for factory transport and trailing sailplanes. Its progressive development is a typical example of systematic work. The company completed the reconstruction of the Z-22 equipped with Praga engine in an effort to decrease operational costs. 31 pcs were manufactured in Otrokovice and another 170 pcs in Kunovice. The production of the excellent Z-26 plane started at the end of 1945. 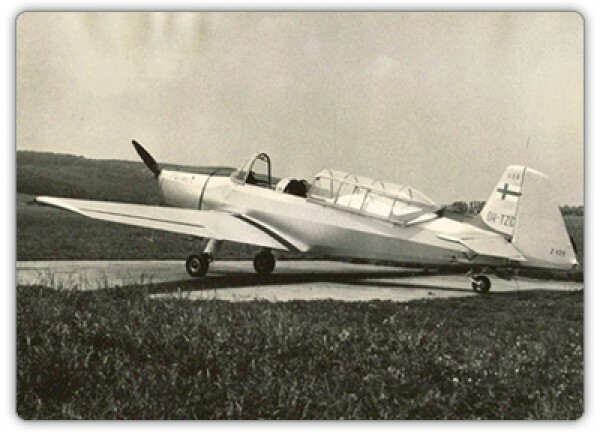 It was made for basic aerobatics and to trail sailplanes, and with it the famous family of “Trener” was established. There were 1493 pcs produced in 6 types and 15 versions in 1947 – 1974. Sailplanes were produced at the same time as motor planes. 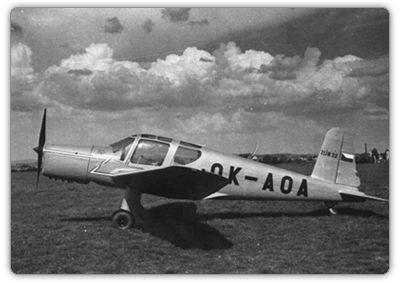 The sailplane Galanečka started to fly in 1949. The most famous sailplane was probably the Z-25 Šohaj. 101 pcs of this sailplane were manufactured and 277 pcs of its modification, Z-125. The Šohaj sailplane was exported to Hungary, Poland and Romania. The company started production of winds Herkules in 1948 and this plane has reached 700 pcs. In the fifties, our company was the producer of many other articles, for example, hydraulic jack Mailers-Benz or a montage of fixed diesel Skoda engines; the production of wooden propellers, cooperation of landing flaps and wings, plane repairs, landing gear wheels, private car components, motorbike components etc. Plane production continued with the next types of planes Z-26, Z-126, Z-226 Trener and trailing Z-226B “Bohatyr”. 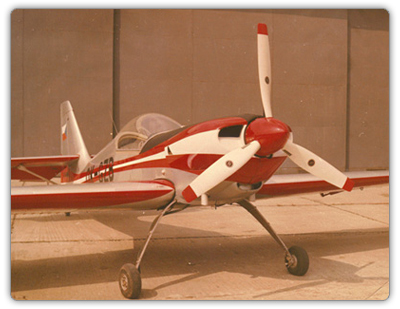 The practice plane Z-226 “Trener 6” started to fly in 1956. More than 60% of pilots were using our aircrafts to begin their acrobatics flying. 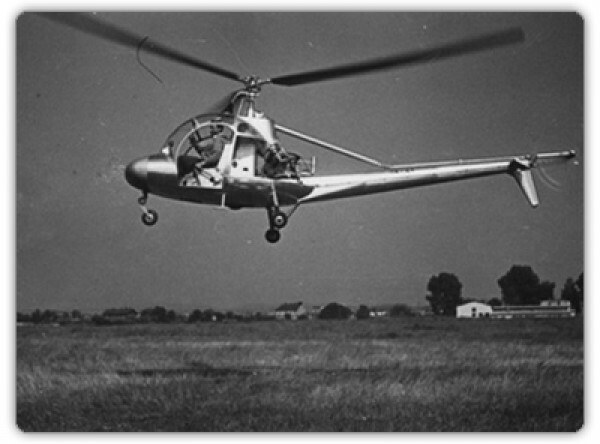 The Trener Z-226 was later modified to a single-seat plane “Akrobat”, type Z-326 with folding landing gear and the next successful modification of Z-526. The production of Trener finished in 1974 with the introduction of the Z-726. 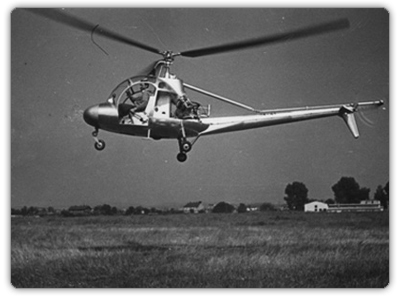 Helicopters HC2 were produced in our company during the years 1958 to 1963. They were constructed in the Aeronautical and Testing Institute in Prague and it was mentioned in the Document of FAI records. Then followed Head Pilot Berg's setting of a national altitude record of 5 345 metres with the Z-35 helicopter in 1962. 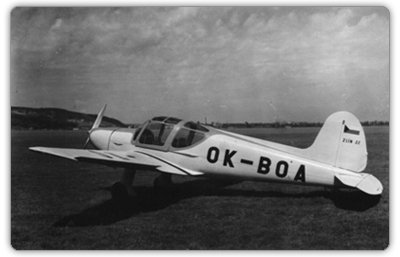 Special two-seat agricultural plane XZ-37 introduced in the sixties. It was made in cooperation with designers from Kunovice. There were 729 pcs produced. In 1965 the International Air Federation (FAI) granted a “Diplome D'Honneur” to our company. It was for success in development of training and aerobatic planes. At the same time the modular concept Z-40 was founded. The training, sport and acrobatic plane Z-42 started to fly in 1967 and193 pcs were produced. Next, the four-seater Z-43 was presented in 1968. 176 pcs of this plane were built until production of them finished in 1993. Serial production of the Z-43 was made with the Z-143L version of the Textron Lycoming. It became famous and its modification Z-143LSi remains in present production plans. In 1973 the management of our company decided to develop a new aerobatic plane. They wanted to participate in a world competition in Kyjev in 1976. The designers created a new acrobatic plane, the Z-50L with the American Textron Lycoming engine. The medal series of Z-50L started in Kyjev and it lasted until 1985! The company manufactured 80 pcs of all versions and modifications. 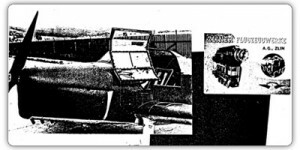 Moravan wanted to keep in step with world trends and modified the Z-42 to the new version Z-142 in 1978. 400 pcs of this plane were produced together with the next modification, the Z-142C + CAF. The last two-seat trainer is the and it is the basic type in present production. Containing the Textron Lycoming engine and certificated in 14 countries including the USA and Canada, it was the Z-242L which opened the North American market to this plane. 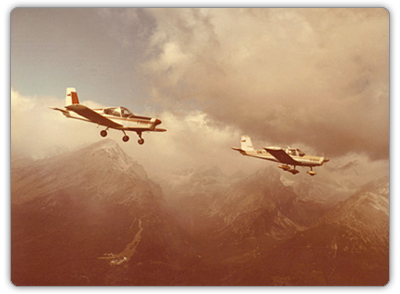 “Zlin Air School” was founded in the mid-sixties. It was re-started after 1989, with two customers in 1990, and 60 customers a year later. They had five planes in 1992. 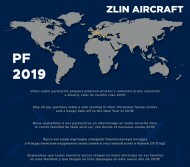 We should not forget about acrobatic competition “Zlinair Cup” featuring our Z-42 and Z-142 planes which became a large social event with many foreign pilots participating. After 1990, Moravan a.s. Otrokovice became a subsidiary company of Aero a.s. and the owners of the company changed a couple of times times during the subsequent years, the company structure changed and insolvency proceeding also occurred. In July 1997, the company was completely flooded by the river Morava. The damages and losses totalled more than 395 million CZK. Production had to be temporarily stopped because the production area was flooded up to a height of 1.5 m and the airport 2 m. During the month of January 2006 the Moravan Aeroplanes company was visited by Mr. Thomas Bata Jr. The company was taken over by QucomHaps Holding Ltd. in February 2007 and the company's name was changed to Moravan Aviation s.r.o. ZLIN AIRCRAFT a.s. was re-founded in 2009 and wishes to continue on the basis of Baťa Zlinská Letecká in ZLIN sports planes production. In the words of a philosopher: History is a series of crisis, and we used to additionally explain them!We do not want to explain historical moments of our company any longer. We have produced more than 7 200 planes for more than 50 countries within 75 years of our history. This includes: 9 types of hydrogliders, 12 types of sailplanes, 64 types of motor planes including reconstructions, 4 types of helicopters, 3 types of winds, 7 types of engines and a minimum of 15 types of planes that remain just within the project! ZLIN AIRCRAFT follows the tradition of ZLIN AIRCRAFT factory in training, aerobatic and multi-purpose ZLIN aeroplanes production. An integral part of production (except for plane production) has been international projects, supporting the production of small transport, acrobatic, sport and other planes, primarily the aeroplane wheel and brakes or parachute components. For example, the wheels and brakes for the L-410, L-610, for the sailplanes L-23 and L-33. Among the products of ZLIN AIRCRAFT are also ejector seats, stabilizer and trafficators. ZLIN AIRCRAFT is major and traditional producer of landing gear wheels and brakes for planes used in the Czech Army. For example in the past, the MIG 15, 19, 21, IL 10, IL 14, JAK 11, AN 28, L-60 Brigadyr, Ae-45, L-200 Morava and more.